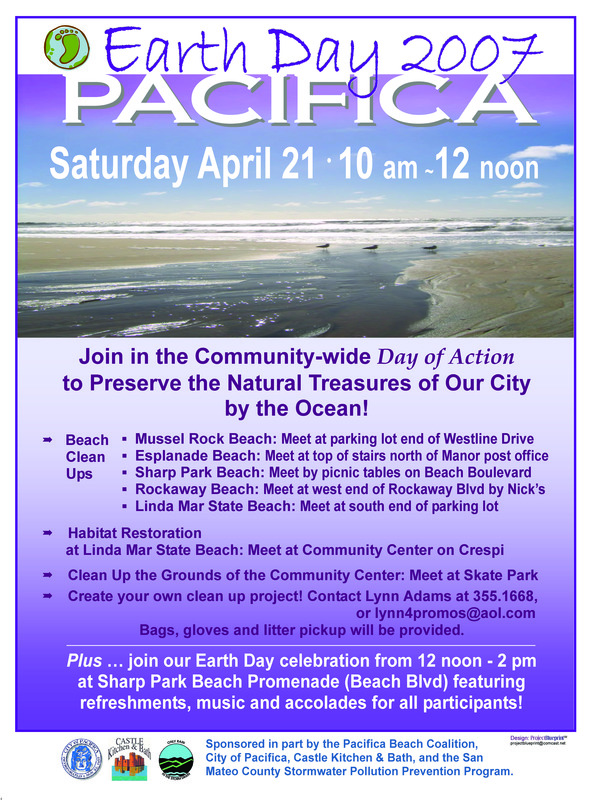 O’Reilly Property Group, Eccleston Inc. and Mazzetti’s Bakery. 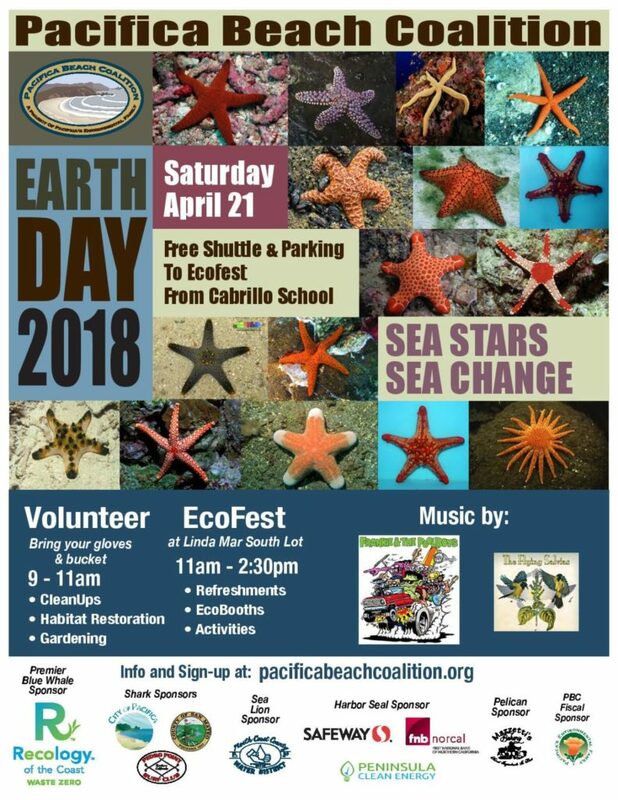 2018 – Sea Star, Sea Change. 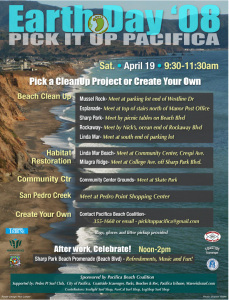 Recology of the Coast, City of Pacifica, San Mateo County, Pedro Point Surf Club, North Coast County Water District, Safeway, fnb Norcal Bank, Peninsula Clean Energy and Mazzetti’s Bakery. 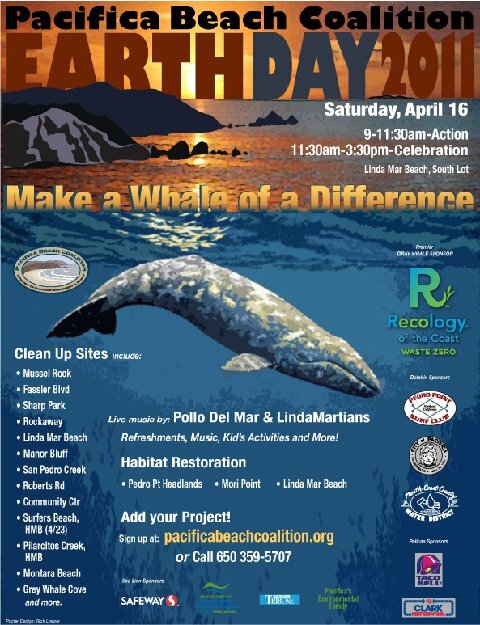 Local Business Supporters and Earth Heroes: American Cetacean Society – SF Bay Chapter, Fitzgerald Marine Reserve, Golden Gate National Parks Conservancy, Greater Farallones Association, Peninsula Clean Energy, San Mateo County Parks Foundation, Sea Shepherd Conservation Society Norcal Chapter, The Marine Mammal Center, Surfrider – SF and SMC, UC Santa Cruz – Raimondi-Carr Lab on Intertidal zone, City of Pacifica Parks Beaches & Recreation, City of Pacifica Police Dept, City of Pacifica Public Works, County of San Mateo Office of Sustainability, County of San Mateo Water Pollution Prevention Program, Edward Humes with Garbology, Green Kids Garden, Friendly Pony Parties & Barnyard Pals, Mitzi Mathews Art Station, Ocean Shore School: Oceans411, Pacific Coast TV, Pacifica 4 – H Club, Pacifica Beautification Committee, Pacifica Climate Committee, Pacifica Environmental Family, Pacifica Gardens, Pacifica Land Trust, Pacifica Libraries, Pacifica Ocean Discovery Center, Pacifica Progressive Alliance, Pacifica Resource Center, Pacifica School Volunteers – Think Bridge, Pacifica Surfboards, Pedro Point Surf Club, Sanchez Art Center, SFSU Eco Students, Skyline College, Surf Camp Pacifica, Terra Nova Band Boosters and TLC Locals. 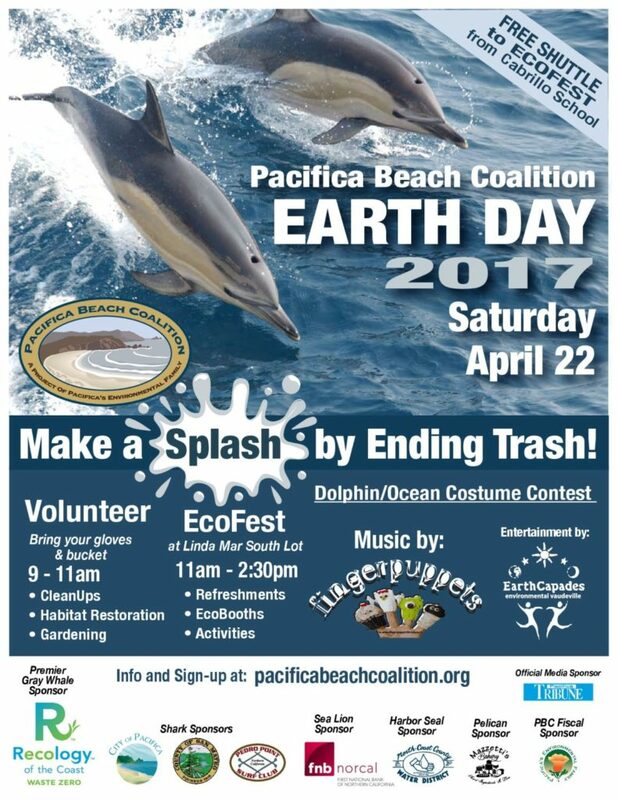 2017 – Make a Splash by Ending Trash! 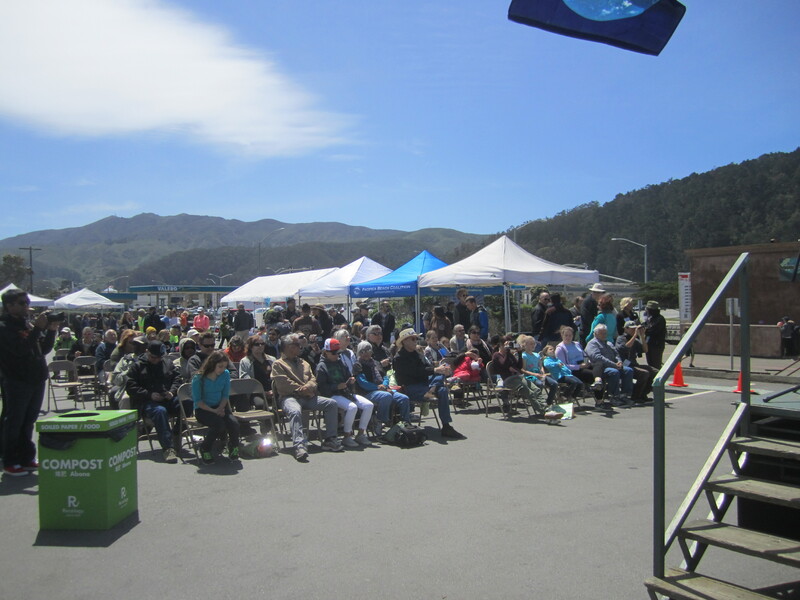 Major Sponsors and Earth Heroes: Recology of the Coast, City of Pacifica, San Mateo County, Pedro Point Surf Club, FNB Norcal Bank, North Coast County Water District, Mazzetti’s Bakery, Pacifica Tribune. 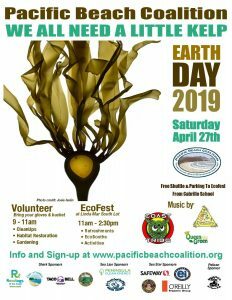 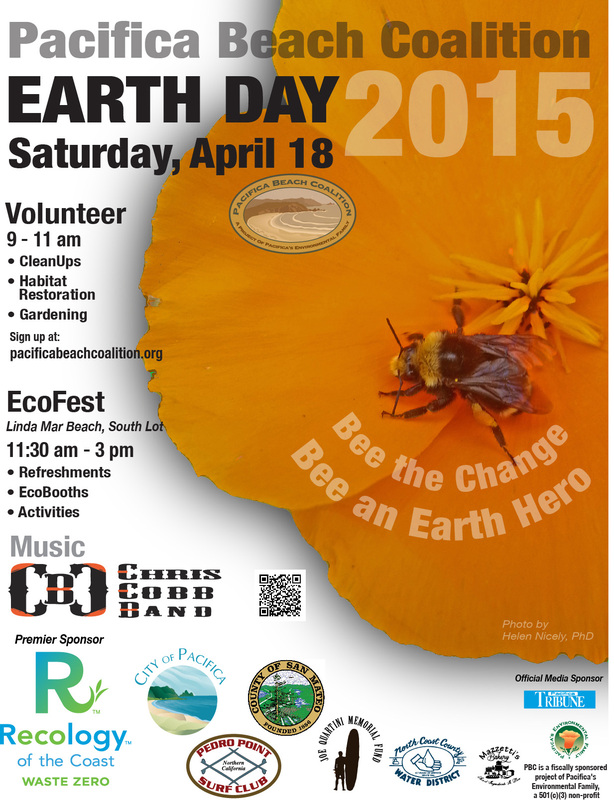 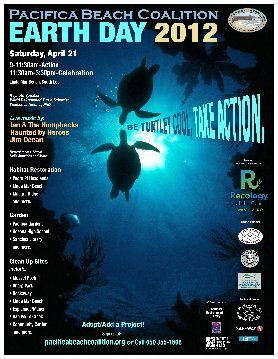 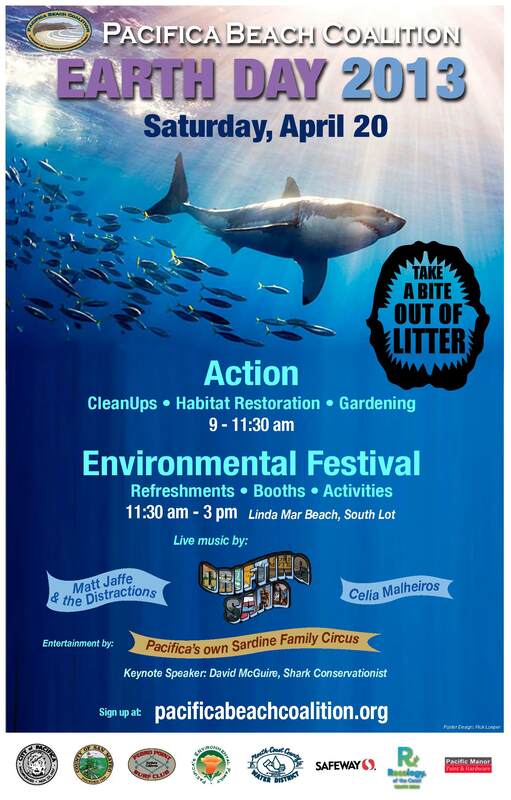 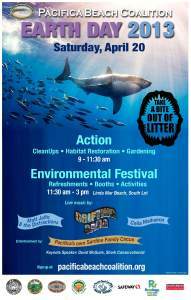 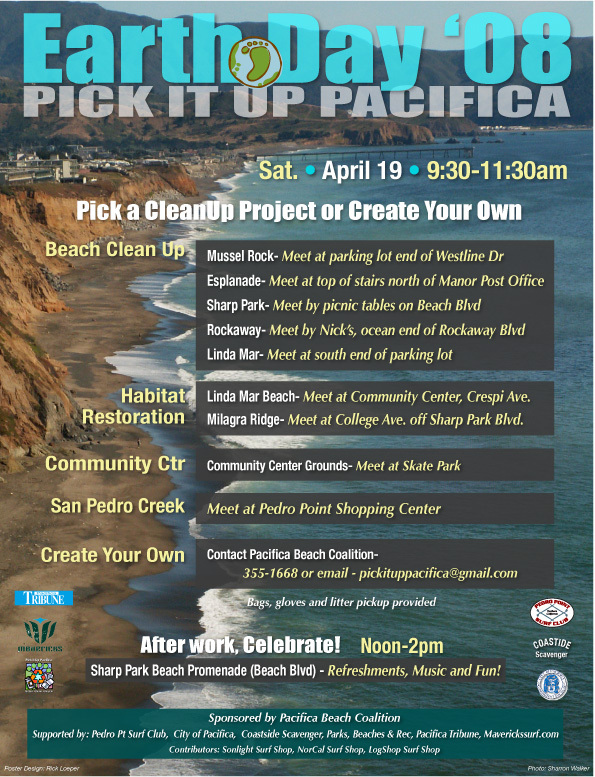 Local Business Supporters & Earth Heroes: Shark Stewards, San Mateo County Parks Foundation, Sea Shepherd Conservation Society NorCal Chapter, City of Pacifica – Dept. 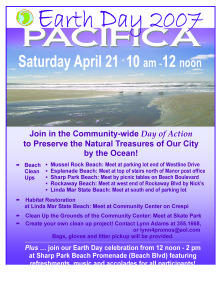 of Public Works, Sanchez Art Center, Pacifica School Volunteers, Pacifica Libraries, Heirs to Our Oceans, Oceanic Society, Pacifica Prevention Partnership – Jefferson Union High School District, Pacifica Parks, Beaches and Recreation Department, American Cetacean Society, Peninsula Clean Energy, The Marine Mammal Center, Pacifica 4-H, Pacifica Resource Center, Ocean Shore, Pacifica Land Trust, Pacific Coast TV, Green Kids Gardens, Pacifica’s Environmental Family, Pacifica Progressive Alliance, County of San Mateo Office of Sustainability, Healthy Planet, TLC locals, Surfrider Foundation San Mateo Chapter, Pacifica Ocean Discovery Ctr, Golden Gate National Parks Conservancy, Pacific Beach Coalition Activity Station, Skyline College, Silicon Segway, Junior Chef Stars, UCCE San Mateo/SF Master Gardeners, Terra Nova Bands, Pacifica Police, Food is Peninsula School Volunteers – Chili and Terra Nova Band Boosters. 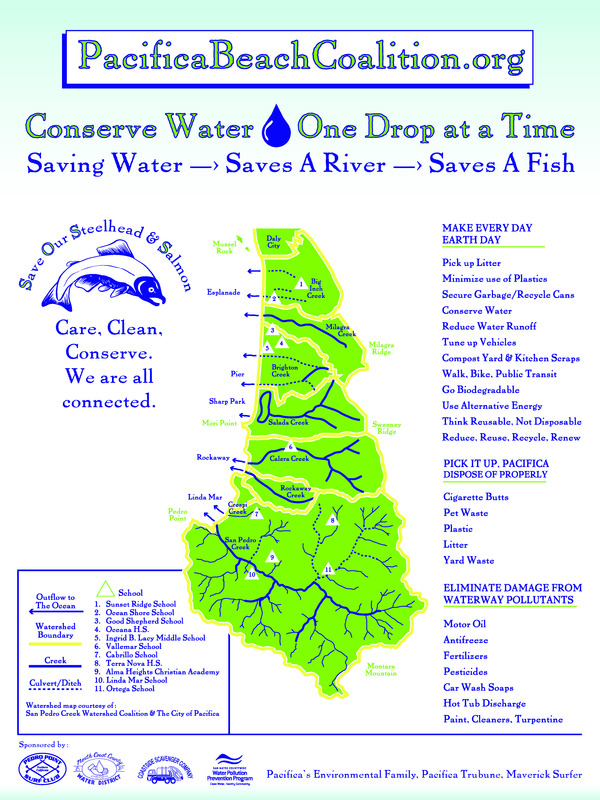 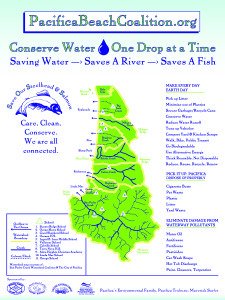 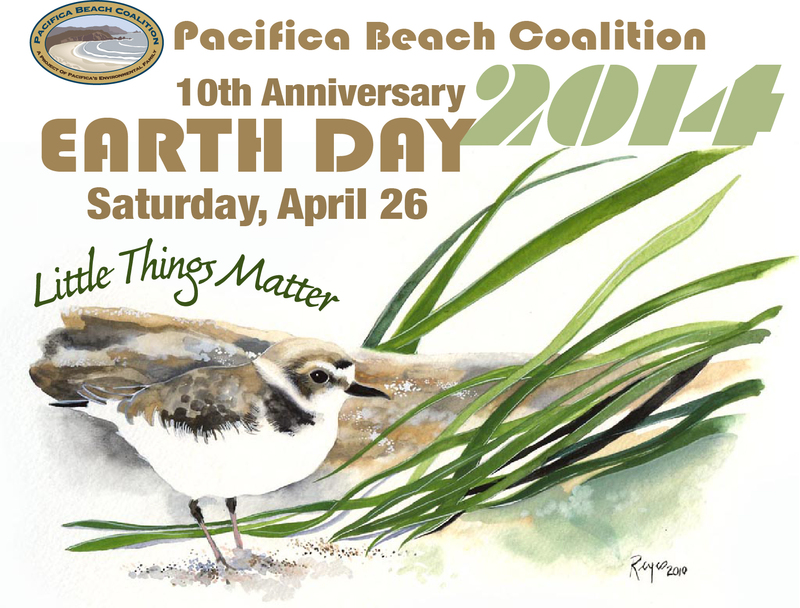 County of San Mateo, North Coast County Water District, San Pedro Point Surf Club, Mazzetti’s Bakery, Pacifica Tribune and the Golden Bough. 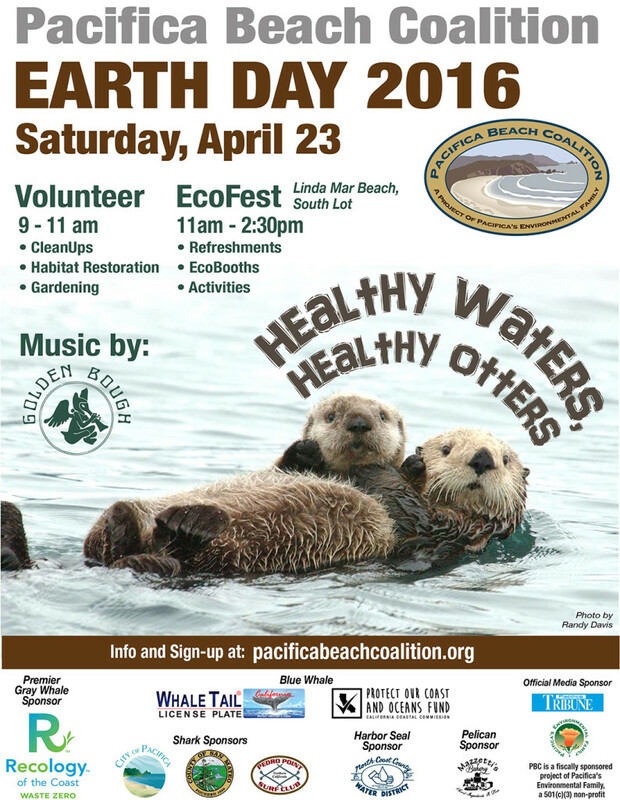 Local Business Supporters & Earth Heroes: American Cetacean Society, College of San Mateo, County of San Mateo Office of Sustainability, Flows To Bay SMCWPPP (San Mateo County), Friendly Pony Parties & Barnyard Pals, Golden Gate National Parks Conservancy, Green Kids Gardens, Monterey Bay Aquarium Sea Otter Research, New Leaf Community Markets Half Moon Bay, Ocean Yoga, Oceanic Oceanic Society, Pacifica 4H, Pacific Coast TV, Pacifica Gardens, Pacifica Land Trust, Pacifica Library Foundation, Pacifica Mother’s Club, Pacifica Police Department, Pacifica Prevention Partnership, Pacifica Public Works Department, Pacifica Resource Center, Pacifica School Volunteers, Pacifica Surfboards, Pacificans for Highway 1 Alternatives (PH1A), Pacifica’s Environmental Family, San Mateo County Parks Foundation, Sanchez Art Center, Sea Shepherd Conservation Society, Segway, Shark Stewards, Silicon Skyline, Spiritborn, Starbucks, Terra Nova Boosters, The Marine Mammal Center and The Otter Project. 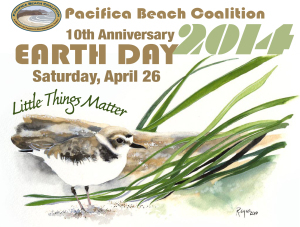 Major Sponsors & Earth Heroes: Recology of the coast, City of Pacifica, County of San Mateo, Pedro Point Surf Club, Joe Quartini Memorial Fund, North Coast County Water District, Mazzetti’s Bakery, Pacifica Environmental Family, Pacifca Tribune. 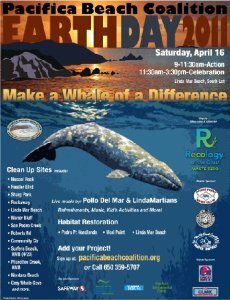 Local Business Supporters & Earth Heroes: American Cetacean Society – SF Bay Chapter, Best Bees Company, Coast Bees, Golden Gate National Recreation Area / Parks Conservancy, Dorsetta’s 2nd Nature, Friends of San Pedro Valley County Park, Junior Chef Stars, North County Outreach Collaborative, Ocean Shore School, Oceana High School, Pacifica 4H Club, Pacific Coast Television, Pacifica Gardens, Pacifica Land Trust, Pacifica Parks Beaches & Recreation, Pacifica Resource Center, Pacifica School Volunteers – Think Bridge, Pacifica Shorebird Alliance, Pacifican’s for Highway 1 Alternatives, Prostate Cancer Awareness Foundation, San Mateo County Beekeepers Guild, San Mateo County Master Composters, San Mateo County Parks & Foundation, San Mateo County Sustainability, San Mateo County Water Pollution Prevention Program, Sanchez Art Center, Scrap/Pacifica Preschools, Sea Shepherd Conservation Society, Silicon Segway & The Marine Mammal Center. 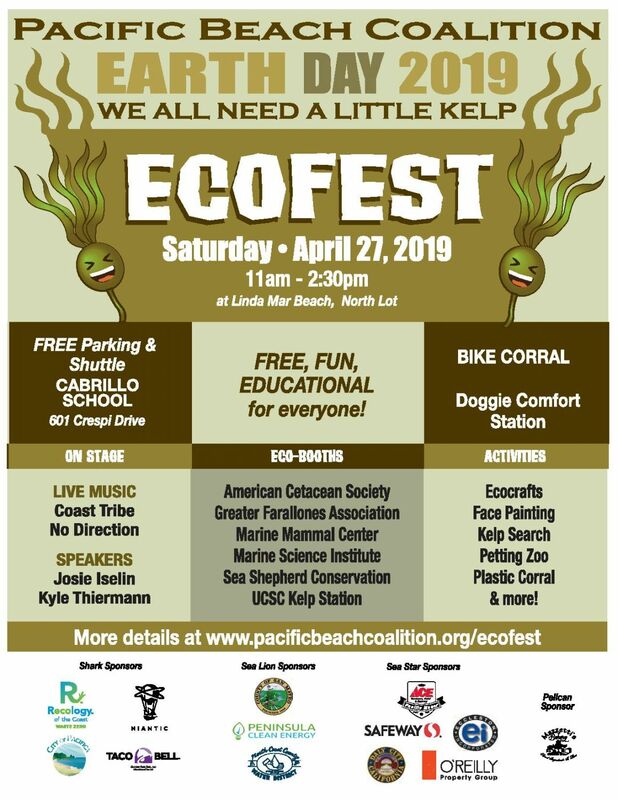 Local Business Supporters & Earth Heroes: 24 Hour Fitness, Adams Video Services, All Care Veterinary Hospital, Anderson’s Swim & Scuba, Best Pets, Bill Oakes, Bleyle Elevator, Bookkeeping Plus, Cabrillo Family Dental, Cannabis Wellness Center, Caroline Totah Organizing Solutions, Castle Kitchen & Bath, Christmas by the Cove, Cigars Plus, Coastside Critters, Colombo’s Deli, Darlene Gonzalez/Stearns Lending, Dial Glass & Window Company, Dig It Landscape & Garden Design, Donna Blethen M.F.T, Doula Spot, Drifting Sand, El Grano de Oro, Eureka Cleaners, First National Bank of Northern California, Florey’s Books, Good and Healthy Natural Foods, Goodfellows Pizza, Holiday Inn Express & Suites, Ian Butler Tree Trimming, Kay Hueng No 2, Kelly A Cunningham Financial Advisor -Edward Jones, Jewels Forever, Jim Wagner/Partners Mortgage, John the Sign Guy, Len Stone/Farmers Insurance, Lovey’s Tea Shoppe, Luigi’s Restaurant, Manning’s Books & Prints, Manor Music, Misha Flores Painting & Photography, Muscio Electric, New Coastside #2 Bait and Tackle, Nicks Restaurant & Sea Breeze Motel, Ocean Fish, Ocean Yoga, Oceana Market, On the Coast Tax Service, Pacifica Coast Real Estate/Chuck Gerughty, Pacific Beach Coalition’s Green Team, Pacifica Playschool, Perfect Pour, Reflections, Rick Bauman Flooring Solutions, Rusty Hook Bait and Tackle, Safeway – Linda Mar, Safeway – Manor, Seaview Brake & Tire, Sound Productions, Studio West Photography, Sue Veterlaus Remax Star Properties, Surf Spot, Surfer Spud, Tam’s Restaurant, The Cut Scene, The Truth Tattoo & Art Studio, You Name It! You can contribute to Earth Day of Action & EcoFest by making a tax deductible contribution or in-kind donation at any time of the year.